How can the public trust regulators who have overlooked the most obvious risk factor for herbicide tolerant GM crops – high residue levels of herbicides in the food we eat – for nearly 20 years? This must read paper details how we’ve come to a place where there is more of Monsanto’s Roundup in our food than many essential nutrients. In research recently published by our laboratory we collected soybean samples grown under three typical agricultural conditions: organic, GM, and conventional (but non-GM). The GM soybeans were resistant to the herbicide Roundup, whose active ingredient is glyphosate. We tested these samples for nutrients and other compounds as well as relevant pesticides, including glyphosate and its principal breakdown product, Aminomethylphosponic acid (AMPA). All of the individual samples of GM-soya contained residues of both glyphosate and AMPA, on average 9.0 mg/kg. This amount is greater than is typical for many vitamins. In contrast, no sample from the conventional or the organic soybeans showed residues of these chemicals (see Fig. 1). This demonstrates that Roundup Ready GM-soybeans sprayed during the growing season take up and accumulate glyphosate and AMPA. Further, what has been considered a working hypothesis for herbicide tolerant crops, i.e. that, as resistant weeds have spread “there is a theoretical possibility that also the level of residues of the herbicide and its metabolites may have increased” (Kleter et al. 2011), is now shown to be actually happening. Monsanto (manufacturer of glyphosate) has claimed that residues of glyphosate in GM soya are lower than in conventional soybeans, where glyphosate residues have been measured up to 16-17 mg/kg (Monsanto 1999). These residues, found in non-GM plants, likely must have been due to the practice of spraying before harvest (for desiccation). Another claim of Monsanto’s has been that residue levels of up to 5.6 mg/kg in GM-soya represent “…extreme levels, and far higher than those typically found” (Monsanto 1999). 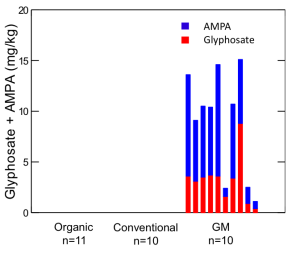 Seven out of the 10 GM-soya samples we tested, however, surpassed this “extreme level” (of glyphosate + AMPA), indicating a trend towards higher residue levels. The increasing use of glyphosate on US Roundup Ready soybeans has been documented (Benbrook 2012). The explanation for this increase is the appearance of glyphosate-tolerant weeds (Shaner et al. 2012) to which farmers are responding with increased doses and more applications. Globally, glyphosate-tolerant GM soya is the number one GM crop plant and glyphosate is the most widely used herbicide, with a global production of 620 000 tons in 2008 (Pollak 2011). The world soybean production in 2011 was 251.5 million metric tons, with the United States (33%), Brazil (29%), Argentina (19%), China (5%) and India (4%) as the main producing countries (American Soybean Association 2013). In 2011-2012, soybeans were planted on about 30 million hectares in the USA, with Roundup Ready GM soya contributing 93-94 % of the production (USDA 2013). Globally, Roundup Ready GM soybeans contributed to 75 % of the production in 2011 (James 2012). The legally acceptable level of glyphosate contamination in food and feed, i.e. the maximum residue level (MRL) has been increased by authorities in countries where Roundup-Ready GM crops are produced, or where such commodities are imported. In Brazil, the MRL in soybean was increased from 0.2 mg/kg to 10 mg/kg in 2004: a 50-fold increase, but only for GM-soya. The MRL for glyphosate in soybeans has been increased also in the US and Europe. In Europe, it was raised from 0.1 mg/kg to 20 mg/kg (a 200-fold increase) in 1999, and the same MRL of 20 mg/kg was adopted by the US. In all of these cases, MRL values appear to have been adjusted, not based on new scientific evidence, but pragmatically in response to actual observed increases in the content of residues in glyphosate-tolerant GM soybeans. Nevertheless, these do not necessarily represent realistic conditions since in practice it is the full, formulated herbicide (there are many Roundup formulations) that is used in the field. Thus, it is relevant to consider, not only the active ingredient, in this case glyphosate and its breakdown product AMPA, but also the other compounds present in the herbicide formulation since these enhance toxicity. For example, formulations of glyphosate commonly contain adjuvants and surfactants to stabilise and facilitate penetration into the plant tissue. Polyoxyethylene amine (POEA) and polyethoxylated tallowamine (POE-15) are common ingredients in Roundup formulations and have been shown to contribute significantly to toxicity (Moore et al. 2012). Our own recent study in the model organism Daphnia magna demonstrated that chronic exposure to glyphosate and a commercial formulation of Roundup resulted in negative effects on several life-history traits, in particular reproductive aberrations like reduced fecundity and increased abortion rate, at environmental concentrations of 0.45-1.35 mg/litre (active ingredient), i.e. below accepted environmental tolerance limits set in the US (0.7 mg/litre) (Cuhra et al. 2013). A reduced body size of juveniles was even observed at an exposure to Roundup at 0.05 mg/litre. Our research also demonstrated that different agricultural practices lead to markedly different end products. Data on other measured compositional characteristics could be used to discriminate statistically all individual soya samples (without exception) into their respective agricultural practice background (see Fig. 2). Organic soybeans showed the healthiest nutritional profile with more glucose, fructose, sucrose and maltose, significantly more total protein, zinc and less fiber, compared with both conventional and GM-soya. Organic soybeans contained less total saturated fat and total omega-6 fatty acids than both conventional and GM-soya. Roundup Ready GM-soya accumulates residues of glyphosate and AMPA, and also differs markedly in nutritional composition compared to soybeans from other agricultural practices. 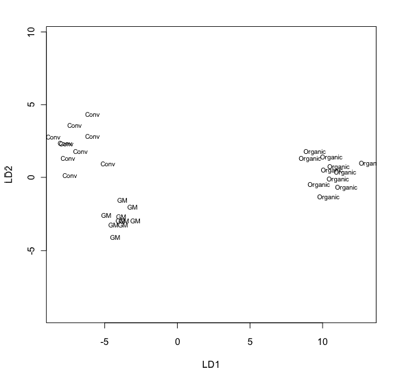 Organic soybean samples also showed a more healthy nutritional profile (e.g. higher in protein and lower in saturated fatty acids) than both industrial conventional and GM soybeans. 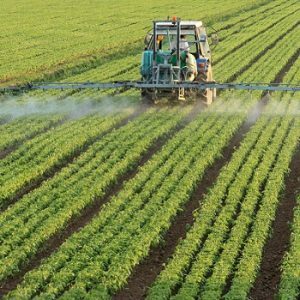 Lack of data on pesticide residues in major crop plants is a serious gap of knowledge with potential consequences for human and animal health. How is the public to trust a risk assessment system that has overlooked the most obvious risk factor for herbicide tolerant GM crops, i.e. high residue levels of herbicides, for nearly 20 years? If it has been due to lack of understanding, it would be bad. If it is the result of the producer’s power to influence the risk assessment system, it would be worse. This article first appeared on the website Independent Science News. We are grateful for their permission to reproduce it here with additional sub-heads for clarity. For the figures and a full list of references see next page.